You’ve probably heard of the NEC in Birmingham, but did you know it hosts more than 500 events every single year? This makes it the biggest and top venue in the UK for businesses wanting to showcase products, network with like-minded individuals and see what’s new on the market. Over 34,000 companies use the NEC to exhibit, attracting more than 2 million visitors every year. The huge space available makes it ideal for events of any size. There are over 182,000 square metres of indoor space with interconnecting halls and over 30 conference suites. Outdoor exhibits are not forgotten either, with almost 400 acres of ground for hard-standing and 75 acres of stunning woodland. 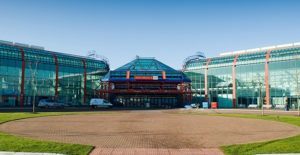 Some of the biggest and most popular annual events at the NEC include the Spring Fair, the BBC Good Food Show and the Clothes Show. Many international brands also hold internal corporate events at the centre, including Coca-Cola, Sainsbury’s and Toyota, to name just a few. The fantastic facilities available for visitors include dining options from the award-winning catering company Amadeus. Other well-known brands include Starbucks and Subway for quick refreshment on the go. Visitors can enjoy use of the free Wi-Fi and there’s even enhanced 3G and 4G internet connectivity, so nobody need miss an email. Opening an exhibition centre outside London, it would have to be in an excellent and convenient location and it certainly is. The centre is well-connected by all transport methods, road, rail and air. The NEC can actually boast being the most conveniently positioned venue in the country. The transport network around the site is amazing and did you know that three quarters of the UK population live within a 3-hour drive of the centre? Connected to Birmingham International Airport and the Airport train station, the centre is close to both the M6 and M42. You’ll also discover there’s more than enough parking, with a whopping 16,500 parking spaces. There is plenty to do when the sun goes down too with the UK’s first integrated leisure and entertainment complex on site. Opened in 2015, the complex includes a 4-star hotel, a casino, spa facilities, an outlet shopping centre, IMAX cinema and no less than 18 restaurants. The leisure and entertainment facilities attract 6,000,000 visitors a year. The NEC and its surrounding facilities really do provide all visitors with the ‘Wow’ factor.